Investors were not impressed with early sales numbers of the new "Call of Duty" game. Shares of top video-game maker Activision Blizzard (NASDAQ:ATVI) declined 17% last month, according to data provided by S&P Global Market Intelligence. For perspective, the S&P 500 lost 6.91% in value. The stock was trending down along with the broader market in the first half of October. 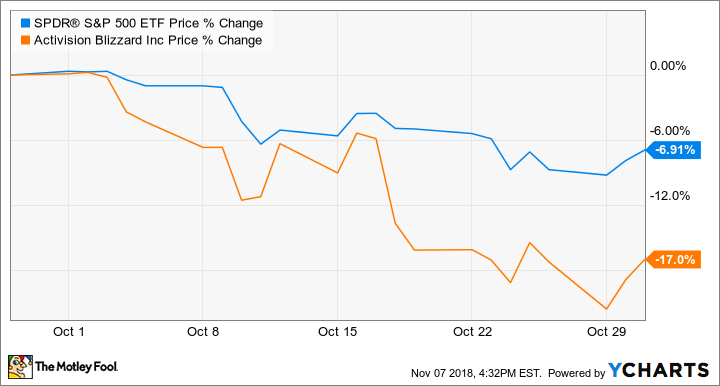 However, the stock took a nosedive of 11.8% in the latter part of the month after the company released early sales numbers for its highly anticipated release of Call of Duty: Black Ops 4, which launched Oct. 12. The annual release of a new Call of Duty game is a big deal for both gamers and investors. It's one of the most popular franchises in the industry and is one of four games that generate two-thirds of Activision's annual revenue. On Oct. 18, Activision said Black Ops 4 exceeded $500 million in worldwide sales in the first three days after launch. It set a record for the highest digital sales on the first day of release for any previous game on Sony's Playstation and Microsoft's Xbox One console. Additionally, Activision said the number of players who connected online to play on the first day of release grew over the 2017 release of Call of Duty: WWII. Screenshot of Call of Duty: Black Ops 4. IMAGE SOURCE: ACTIVISION BLIZZARD. Apparently, investors wanted to see higher initial sales since last year's version also sold $500 million during opening weekend, which would imply flat sales growth year over year. Plus, Black Ops 4 was designed to tap into the soaring popularity of "battle royale" games, which may have led some investors to believe that this game would deliver bigger sales numbers than it did. Despite the market's negative reaction, investors might have been jumping to conclusions too soon about Black Ops 4's sales prospects. Black Ops 4 was the third most watched game on Twitch during October. That fact not only spells big esports potential, but high interest on Twitch could lead to continued strong sales in the months ahead as trending titles on game streaming sites can go a long way toward attracting new players. Investors will get more details about how well Call of Duty: Black Ops 4 and other games are performing when Activision Blizzard reports its third-quarter earnings on Thursday.